Great idea CCT...especially on cold days. just realized I am clamping molds too close together, in the middle of the molds!!! I pour, say...10 molds (8-12 carrot molds) or so and use 2 of the 600 lb. 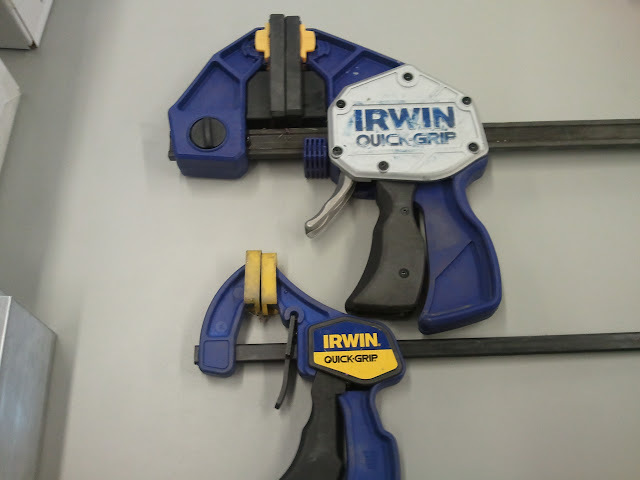 Irwin clamps. Is that enough?? "Be sure to fillet and re-grease!" "WATCH THE FOX, "fair and balanced" in a world filled with leftwing media types! Obama's added 15 million to food stamp roles in 4 years (and growing).."If you pay folks to be poor then you'll have a lot of poor people"
I have the little Irwin ones and within about 3 months they are already starting to seem like they're fading. I think I might go with the bigger ones. The small ones are so cheap though. I think I got 4 for 25 dollars on amazon. I haven't had any issues w/600 lb Irwins...they are pricey (high 20's), but again.."quality is LONG remembered after price is forgotten"
I bought my clamps at Harbour Freight. $3.00 each for the one that opens to 6.25". They have all sizes. I was leary at first because HF is really cheap stuff. BUT, I have not had any problem with them. I believe the Irwin at Home Depot was $11.00 for the same size. Be really careful with your choice of equipment and protective clothing. One mishap will far exceed any money saved if you get hurt. I know for a fact this isnt giving out - clamping 2 molds is easy - 3 takes a little bit of finesse (but the middle does not slip) - If I need to do a vertical mold (DD Gill) - I just rotate the vice 90 degrees. I kept 'fighting' the quick grips and had no good place to 'set' them to keep them out of the way so I could inject - this (which I already had) seems to solve that. You've got to do what you feel comfortable with, but I don't think money should get in the way of safety. 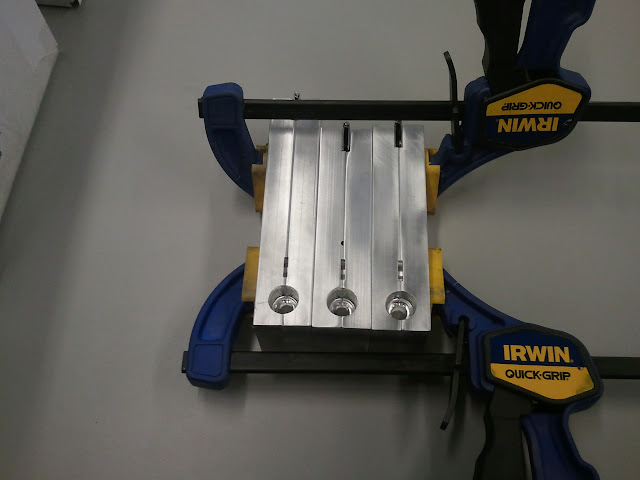 I started with 100# Irwin clamps and quickly went to the 600# vises. I feel a whole lot safer using the larger clamp, especially when pouring multiple molds. It seems to me that the molds would have to be centered in the bench vise bench vise. If the spru is on the end of the mold, you would be applying downward pressure to an unsupported part of the mold. Perhaps unlikely, but that would be an accident waiting to happen. And its not about saving money as much as it is "using the right tool for the right job" - with the quick clamps I'm constantly trying to position them + get them tight + have a place to set the molds to shoot them - then have a place to set the clamps to demold + rinse repeat.... I was starting to use the bench vise as a mini "jig" to hold the clamped up molds when it dawned on me I had a hell of a vice right there. The vice will work if one is careful. Keep in mind that a guy can put a tremndous amount of pressure on the molds using a vice and that can result on warping if the aluminum is hot when pressure is applied. You can also experience some venting issues along the line where the jaws make contact with the mold too....some vents are super thin and can close off darned easy. I have a couple of bench vices but I only use the Irwin hand clamps for doing the plastics. On those clamps, I measured out the most length of rail I will need for my clamping needs and drilled a hole and put a nut/bolt in the hole, then I cut off the extra rod. 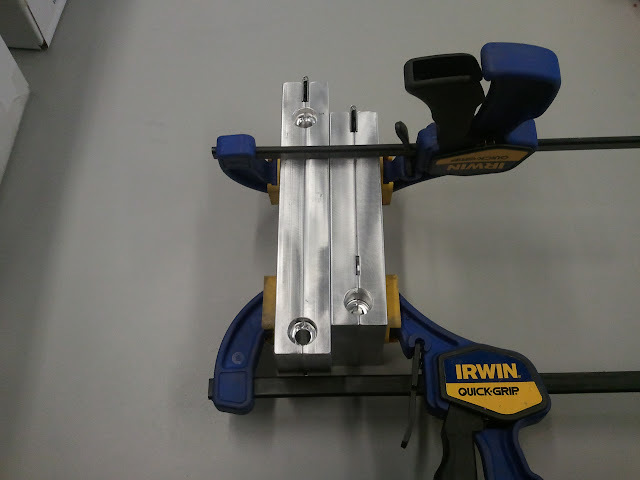 These clamps can get gangly when you're working in close quarters. Shortening the rails sure makes them easier to use. Great things come to those that Bait ! I recently switched to these in the 18 inch after using the Irwins for a while. These grip stronger and are easier for me to break loose. Nothin better than paddlin my Jackson Coosa and motor boatin a frog. what to buy? 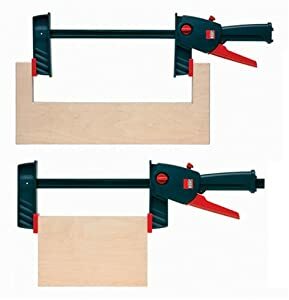 larger or smaller clamp?